Popular Culinary Gem: You’ve Got to Dine at R Cottage in Washago. 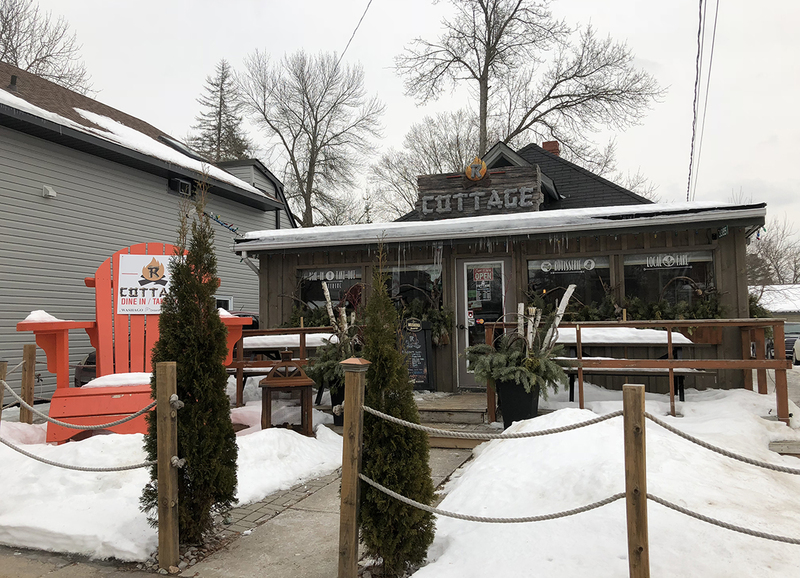 With a name like R Cottage, you would expect to find rustic decor, warm friendly staff, and grilled hamburgers and hotdogs – the type of food you would find being prepared at a cottage. Well, we got most of that right. We were wrong about the food – and pleasantly surprised when the food arrived. This popular eatery in Washago Ontario is truly a must visit when in Ontario’s Lake Country. Read on to find out why. Owner and Chef Ian Thompson believes that quality ingredients deserve quality care, and that is showcased well at R Cottage. Born in the small town of Palgrave Ontario, he is a graduate of the respected George Brown College Culinary Management Program. He has worked at many established chain restaurants, trained at a highly sought-after seafood restaurant in Kinsale Country Cork on the Celtic Sea, and sharpened his cooking techniques with extensive travel throughout Canada. R Cottage is a homespun, rustic eatery located in the heart of downtown Washago Ontario. Just a short drive from Casino Rama and the town of Orillia, R Cottage is centrally located close to the north shore of Lake Couchiching. Ian and Sarah Thompson, owners of R Cottage, dreamed of one day owning a cottage, where they could entertain friends, and serve delicious homemade food. That dream became a reality when they opened the doors of R Cottage. Guests feel more like extended family, and are treated as such. Chef Ian Thompson smokes all of his own meats, and uses a rotisserie to cook his chicken and roasts. R Cottage features free-range chicken, prime rib, hearty sandwiches, healthy soups and salads. All ingredients are fresh and local. R Cottage is designed to make you feel like you are dining at a cottage. There is a dining area, a sun room, a family room, a kitchen, and washrooms designed like outhouses. The dress is casual and comfortable. There are colouring books for kids, board games, magazines, and books, all found at the entrance. The music is very reminiscent of cottage living. Clearly, the Thompson’s have thought of everything. Your food is served family style to your table. Beautiful wooden plates are used to give it a warm cottage feel. Now normally I don’t talk about the washrooms in a restaurant review, nor would I take pictures of them. But, the staff at R Cottage are quite proud of their decor, and wanted me to see everything. … and the women’s outhouse (picture taken by Wendy). Don’t worry… both the men’s and women’s facilities are indoors, right off of the dining room. And, they are the cleanest outhouses I have ever seen! Blends of greens, with purple cabbage, julienne carrot, tomatoes, cucumber, and red onions, served with maple balsamic vinaigrette. My Mum makes my favourite potato salad. I think I just found one that is different, but just as good. I’m really picky with coleslaws. This one was really good. This was probably the best macaroni salad I have ever eaten. Creamy cheddar mornay, caramelized onions, cherry tomatoes, and wilted baby arugula, tossed with cavatapi pasta, garnished with a hickory stick crust. Corned pulled pork shoulder, beer braised and cherry wood smoked, seasoned with our cran-b-que sauce, sauerkraut, swiss, 1000 island, and R Cottage slaw, on a toasted garlic bun. Served with spicy mustard. Rotisserie chicken, homemade Willowgrove Hill in-house smoked pork belly, vine ripened tomatoes, leaf lettuce, garlic confit green peppercorn aioli, and aged cheddar, on a GMO-free roasted red pepper and onion ciabatta. Best seller: In-house Whisky smoked AAA Alberta beef shaved Ribeye, caramelized onions, local sheeps cheese, and wild mushroom jus on a garlic Provençal GMO-free bun. Mesquite smoked 1/2 lb bison blend pattie, topped with marsala wild blueberry BBQ glazed short rib, four herb chimichuri mayo, and frazzled onion, on a locally baked brioche bun. Freshly baked, from by-the-rock Farm. Absolutely delicious! Graham cracker crust, soft cheesecake, topped with marshmallows, crumbled graham cracker, and a chocolate sauce drizzle. Flakey pastry, filled with melt-in-your-mouth buttery goodness. Since having kids, and taking them out to restaurants, I have always said to Wendy that if my kids love the food, and if the wait staff treat them like gold, the establishment has won me over. To say Chef Ian nailed his selections for our family is an understatement, and the staff treated all of us like family. The look of shock on Lauren’s face when the sandwiches arrived mirrored the rest of us. The salads were fantastic, the sandwiches were incredible, and the desserts were mouth watering. We almost finished it all! Well, technically, we did. Leftovers in a couple of takeout containers, and it made for a great snack! We each had our favourites: I loved the Smoked Prime Ribber Dip and Duck Confit Macaroni Salad, Wendy loved the Cottage Club and Spud Salad, Rachel loved the R Cottage “Pulled Pork Reuben” Sanny and Cottage Mac N’ Cheese, and Lauren loved the R Burger and R Cottage Slaw. The desserts were the cherry on top… which we almost didn’t finish them. Almost. All of the baked desserts available at R Cottage are made by Richard and Teresa Mount, owners of by-the-rock. With “From our Farm to your Home” being their tag line, you can expect super fresh! Vegetables, pies, preserves, maple syrup, nature crafts and more. They are located at 2007 Coopers Falls Road in Wastage. As well as the locally sourced baked goods, R Cottage is well known for it’s signature S’Mores Milkshake. We were offered them after dessert, but were just too full. It’s on our must try list for our next visit. Feel like taking your food home, or to your own cottage? R Cottage offers all of their menu as take out. As well, you can purchase a jar of their famous homemade Pick R Pickles. Available in Original Dilly, Extra Garlic, Habanero, and Horseradish. In the Spring and Fall of each year, several restaurants in Ontario’s Lake Country participate in Flavours of Lake Country, a 2-3 course Prix Fixe lunch and dinner event that draws in lots of locals and tourists. R Cottage is a proud participant in this awesome culinary event. Flavours of Lake Country runs from April 6th to April 22nd, 2018. If you get a chance, make a reservation at R Cottage, and try some of Chef Ian’s creations. Trust me when I say this – you won’t be disappointed! R Cottage is located at 3385 Muskoka Street in Washago, just north of Orillia (at the top of Lake Couchiching). Reservations are not required, but highly recommended – this is a very popular place with limited seating inside and on the patio (weather permitting). You can follow R Cottage on Facebook, Twitter, and Instagram. You can also see what other think of R Cottage on Yelp. Disclaimer: Our meal at R Cottage was covered and organized by Ontario’s Lake Country. All opinions are my own.